Musik Indonesia 1997-2001: Kebisingan dan Keberagaman Aliran Lagu. Jeremy’s articles for Norient: http://norient.com/author/wallach. 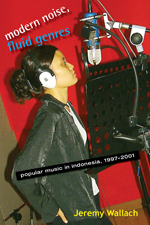 Wikipedia entry for Indonesian popular music recordings. Musikator, Indonesia Music Think Tank. USA Today book review: ‘1969’: The year, and a book, that defined an era. Paper on a local rock club I wrote my first semester of grad school. MIDSEM 2011 Call for Paper Proposals. BGSU journalism student’s blog entry about Jeremy and the popular culture department. Singing In The Street of Jakarta. Heavy metal in academia – interview with Dr. Jeremy Wallach. 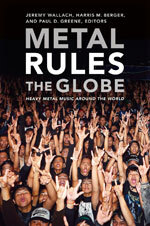 Metal Rules the Globe: Heavy Metal Music Around the World. The Weird Global Appeal of Heavy Metal.